This is simple, delicious, and requires no modification to be GAPS-legal. This is our favorite "treat food" for dinner when we are feeling down about the food restrictions- you can't feel down when eating this! Choose artichokes that are firm and green over ones that feel "squishy" and have deep splits in the leaves (these can be okay too, but aren't the best). Wash them. Pull off the small leaves around the stem, these are very bitter. With a sharp knife, cut off the spiny end- the tips of the leaves bunched together at the top. With scissors, trim the sharp tips off of the remaining leaves. Cut off the tip of the stem where it is brown. Some people prefer to trim off most of the stem, while others feel that the stem is the best part and should be saved. To do this, carefully remove the outer skin around the stem and leave the soft inner part attached (like the one in the picture). Place them stem-up in a steamer basket, or if they don't fit, you can slice each one in half lengthwise first. Put enough water into the bottom of the pan to not quite touch the artichokes. Into the water, put about 4-5 whole cloves, 2-3 cloves of garlic cut into several pieces, a bay leaf, several black peppercorns, some red wine or vinegar, a few cardamom pods if you have them, or other savory spices that you like. Cooking time varies quite a bit depending on the size of the artichokes and their age. 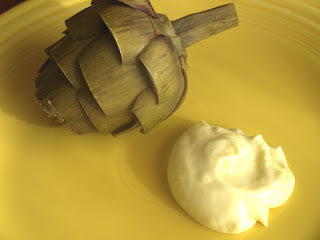 For smaller artichokes, I would check them after about 25-30 minutes, larger ones can take more like 45 minutes to steam. Check them by poking the choke end with a fork for tenderness. Let cool a little and serve with lemon garlic mayo, or just melted butter with garlic. Combine 1 cup of GAPS-legal mayonnaise (I make my own), the juice of half a lemon, and 2 (or more) cloves of garlic, crushed. Add salt if desired. We are growing bell peppers in our garden this year and wanted to find a special way to use them. These were delicious, my 8-year-old ate 3! This is one of those recipes that you can just "eyeball" as you go along, and is infinitely variable. I'll list out approximately what we did and estimates for amounts, but have fun with this! It's hard to go wrong! 2 tsp cumin, or more! To make the filling, heat some cooking oil or fat in a large skillet. Finely chop the onion and saute on low heat for about 5 minutes. Add the seasonings and crushed garlic cloves, and stir. If using hot or other peppers (such as Anaheim or Poblano for flavor) dice and add them now. Once these have cooked together, add the meat and saute until meat is just done. If you want "rice" in it too add some grated cauliflower about 5 minutes before the meat is done. 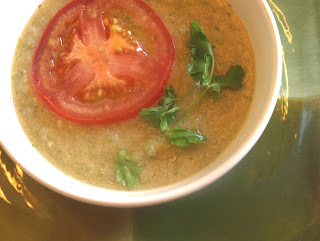 Turn the heat off and mix in chopped cilantro, then taste and adjust the seasonings if needed. Preheat the oven to 350 degrees. To prepare the peppers, you can either cut them in half lengthwise if they are long and thin, or cut the tops out if they are short and round (in the picture you can see one of each). Remove the seeds. Oil the bottom of an oven-proof pan with a lid that is big enough to fit all of the peppers in a single layer on the bottom. 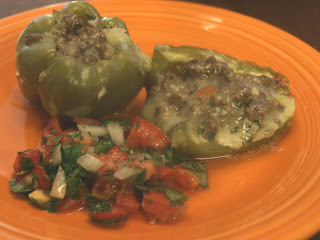 Carefully fill each pepper or pepper half with filling and place open side up in the pan. In a small bowl, mix together the broth and the tomato, chopped. Season with salt and crushed garlic if desired. Pour this mixture around the peppers. Place the lid on the pan and bake for 30-45 minutes. Melt cheese onto them at the end if desired. Delicious with fresh salsa and guacamole. VARIATION: use a variety of chopped veggies instead of the meat for veggie-stuffed peppers. 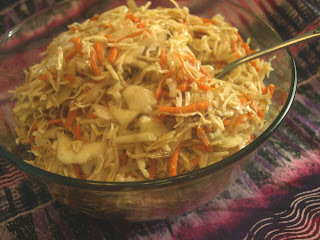 This salad was a favorite of mine before starting GAPS and has become one of my favorite diet-legal comfort foods. It is also my current favorite replacement for potato salad. Cook the beets and chop into bite-sized pieces. Cut the apples into similar sized pieces. Dice the pickles. Combine these ingredients in a medium bowl, and add the onion. Pour on enough olive oil to coat the vegetables nicely. Stir in a few spoonfuls of mayonnaise, add the salt and any other seasonings if using, stir, and then add some vinegar. The dressing is really a matter of preference. I like to keep the dressing light and tangy. This is a very attractive-looking salad and works well on special occasions. I was dying for a cup of coffee last weekend (decaf, but still), and I don't like it without half-and-half or cream. I also wasn't in the mood for coconut cappuccino. Since we can't have uncultured dairy on GAPS, I needed to come up with an alternative. I was thinking of these artificially-flavored coffee creamers that are filled with hydrogenated oil that my mom likes, and I thought I could make a healthier version of one of those. I think that this recipe was a success. My husband thought it tasted great in the coffee too, and he can eat whatever he wants! I used 1/2 cup honey and thought it was a tiny bit too sweet. I'm going to try 1/3 cup next time. I also plan to try different flavors in the future, especially vanilla. This makes enough for two to three cups of coffee (at least the way I like it). Heat coconut milk in a medium saucepan to just boiling. Beat the egg yolks until they lighten in color. Add the salt and honey and continue to beat until thoroughly blended. Add hot coconut milk, a little at a time, to egg yolk mixture, while beating. Put the entire mixture back into the saucepan, and heat over medium low until mixture begins to thicken. Add to hot coffee in desired proportion, and enjoy. My 8-year-old suggested that we make cucumber noodles using the same technique that we use to make zucchini noodles, but eat them raw instead of cooking them. 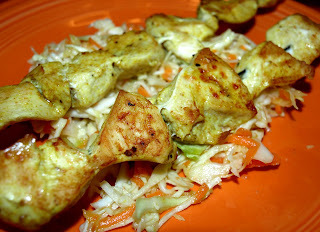 This seemed to lend itself to a Thai-style dressing so this recipe was created. These are delicious and are one of my husband's favorite foods on the diet. *I get my spice blends from Mountain Rose Herbs and have not had a problem with them. Peel the cucumbers. Take a cucumber and hold it over a bowl, and peel off thin strips using a vegetable peeler into the bowl. I stop when I get down to the seeds. Continue until all the cucumbers have been shredded. Put the shredded cucumber into a colander over a bowl or sink, and mix in the salt. Let stand for at least 15 minutes to draw out excess water. Mix together the remaining ingredients to make the dressing. The dressing will be very thick, but it will thin out once added to the cucumbers as they give off more water. Dress the cucumber noodles when they are ready. Garnish with the chopped cilantro, chopped peanuts and tomato slices, or whatever else you would like. NOTE: To save time, you could make this as a salad by thinly slicing the cucumbers with a food processor instead of shredding them. This dish is great for summer barbecue parties. The recipe works well with shrimp, and would probably work well with other meats as well (pork, etc). I suggest making a lot of it and using the leftovers for easy lunches. *I use the curry powder from Mountain Rose Herbs, but there are many recipes online to make your own, and there is also a good recipe in Raman Prasad's book "Recipes for the Specific Carbohydrate Diet". Combine the ingredients for the marinade, multiplying the units in the ingredient list by the number of pounds of meat to be used. Chop the meat into bite-sized pieces and marinade for at least 30 minutes, preferably several hours (in the refrigerator). If using shrimp, marinade whole. Put the meat on skewers and grill it on both sides until done. The meat can also be cooked in the broiler, about 5 minutes per side, but check often. Cooking time will vary depending on how small the pieces are. Combine the ingredients for the peanut sauce and serve along with the meat for dipping. The peanut sauce can be thinned by adding additional coconut milk if desired. 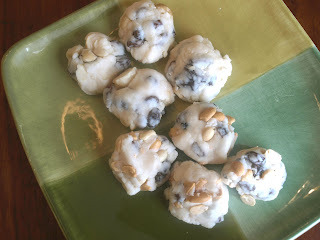 Two coincidental events led to this recipe- first, I rediscovered the simple joy of eating raisins and nuts together in the same mouthful, and secondly, I had a terrible craving for chocolate-covered peanut clusters. Something had to be done, and fast... I made a batch of the coconut candy from the Holiday Candy post and added in raisins and nuts, let it chill, and it came out wonderfully! The recipe for the coconut candy comes from Julie Matthews' book "Cooking to Heal", and which she calls white fudge. Put the coconut butter into a food processor (it will be chunky), and pulse briefly to break the chunks into smaller pieces. Heat the coconut oil just enough to melt and add it to the food processor while on. Add the honey, salt and extract. Put mixture into a medium bowl, add in the raisins and nuts, and mix together by hand. Form balls about 1.5 inches across, squish somewhat, and place on a baking sheet lined with parchment paper. Place the baking sheet in the refrigerator and chill for at least 15 minutes. Store in the fridge. NOTE- any combination of nuts and dried fruits would work, or of course all nuts or all fruit would be good too. Also, other flavor extracts can be used to provide some variety.